Granite countertops are a beautiful addition to any kitchen or bathroom. When granite is properly cared for, it’s durability and beauty stand the test of time and add great value to your own. Follow a few of these easy tips to keep your granite as well maintained as possible. Because granite countertops are made of stone, they are extremely durable. However, they are not immune to scratches and stains. Sealing your countertops with a high-quality sealant will provide an extra layer of protection from all general wear and tear by filling in the pores of the stone and preventing food and debris from wearing down the stone. Plus, a seal will add a little shine and luster to the look of your countertops. Apply the seal when the granite is completely dry, buff with a rough cloth. Your countertops will need to be resealed every 1-2 years. The general maintenance for your granite is very simple. Because itis sealed, it’s generally a good idea to clean with soap and water. Soap and water will clean the stone without harming it. 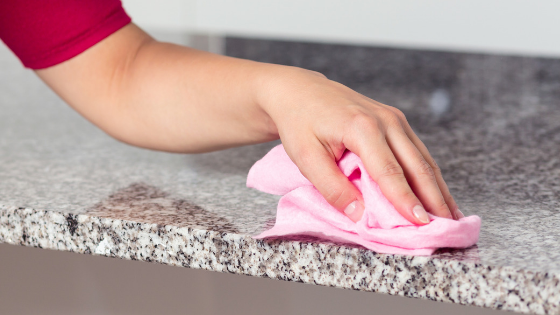 Be sure to wipe away spills immediately before they can seep into the granite. Take care especially with oil-based spills as they can discolor the granite with prolonged exposure. Hot pots and pans can be placed directly on granite countertops because they are stone, they’re not prone to thermal shock or burning. To keep the luster of your sealing fresh, polish your granite monthly. Though stone is very durable, it is not indestructible. There are a few things that can harm your granite countertops. One of the more surprising things on the list are common household cleaners. Any cleaner with harmful chemicals or anything acidic (i.e. lemon juice, lemon oil, vinegar…) can wear down your sealer and leave your granite vulnerable to stains and scratches. Another common mistake is to cut directly on your stone—you can cut directly on the stone and though it likely won’t harm the granite (though it can scratch it) it will dull your knives. Take care and use a cutting board for extra precaution.